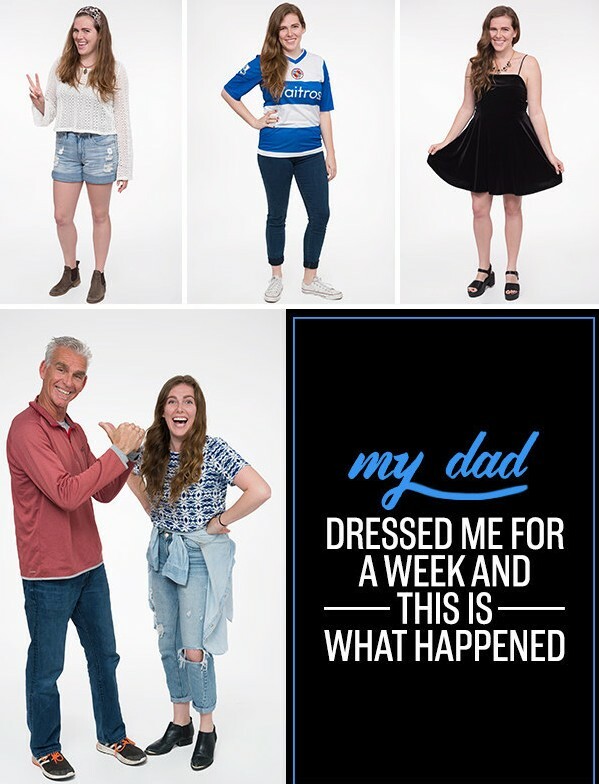 Her Dad Picked Her Outfits For A Week And Here's What Happened! Her Dad Picked Out Her Outfits For A Week And Here’s What Happened! What will happen if your dad chooses your outfit for the week? Read the article below and check what happened after a week! Hi, I’m Casey, and this is what I usually wear: a pair of pants, a colorful top, and my black boots, which are steps away from having holes in them. Oh, and my chambray button-up that’s basically my adult version of a little kid’s stuffed animal. But since I wear my ripped jeans 24/7 — I can feel the dreaded thigh hole forming — and a random top, I figured it’s time to mix up my look. And who better to tell me what I should wear than the person who dressed me before I could dress myself: my dad. Everyone, meet Marty. He’s known me for 25 years, which means he’s seen me go through every one of my clothing phases. Because of his unofficial degree in “Casey’s Life Choices,” I’m interested to find out how he sees me and what he thinks I look best in. My dad’s thoughts pre-experiment: Whether I’m going out with friends or meeting the president, I’m a T-shirts, jeans, and the best sneakers I can put on my feet kind of guy. So when Casey asked me to pick out her wardrobe for a week, I thought she had hit rock bottom. 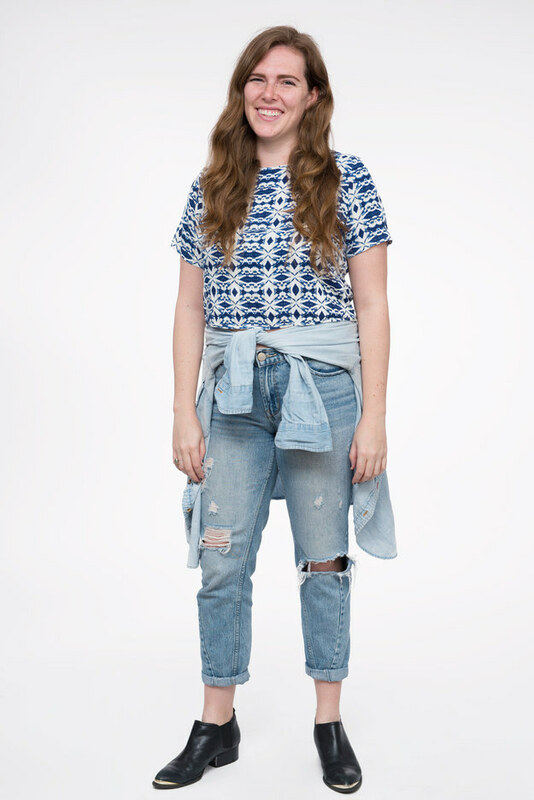 Casey’s style is casual. 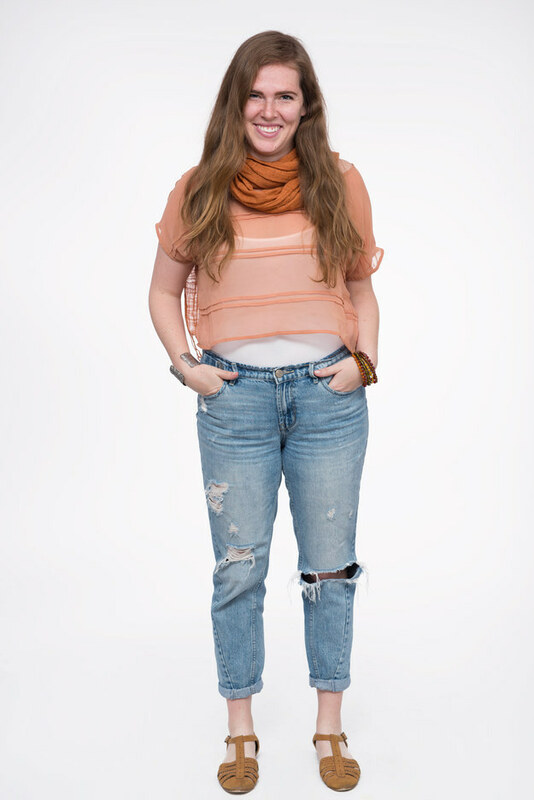 Pants and tops mostly — loose-fitting clothes. She tends to buy most of her clothes if they’re on sale. I would like to see her pick out the outfits that she wants instead of looking at the price tag all the time. Buy one thing you really love instead of two things that you kind of like. The more I think about it, the last time I picked out Casey’s clothes for her was for a soccer weekend when she was 10! I have no idea what’s about to happen, but I know it’s going to be fun. 2. If there was something my dad wished I could wear that I didn’t own, I would borrow something from a friend or my mom (hey, Mom). 4. I wouldn’t tell my dad how I felt about the outfits until the experiment was over (even if I thought I was about to explode from embarrassment). 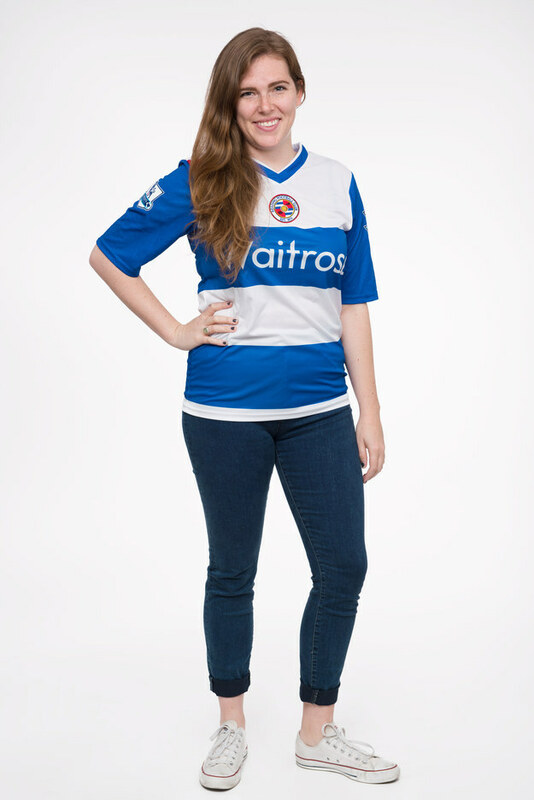 Why my dad picked this outfit: I put Casey in the same jersey worn by the players on the Reading Football Club. Go Royals! Any chance I have to put my daughter in horizontal stripes, I’m taking it. I wanted her to keep her hair simple and have a hair tie ready just in case she wanted to get into a pickup game of soccer in the park. White Cons because they go with everything. Why my dad picked this outfit: The inspiration for this look was, “What if her dad was Blake Shelton?” I worked up from her feet on this outfit — loved the shoes and went from there. Because I don’t see Casey in leggings that often, I thought dark tights and a hip dress would look nice. 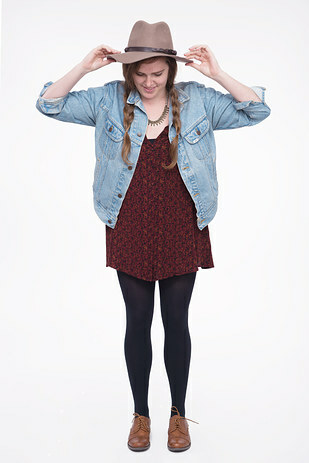 Then I added a worn denim jacket to lighten up the dark colors, and asked her to braid her hair under a hat. It only made sense. Casey’s Outfit #2 reaction: Well, this day started off with a “You look so cute” in the kitchen, so my dad apparently knows what’s up. 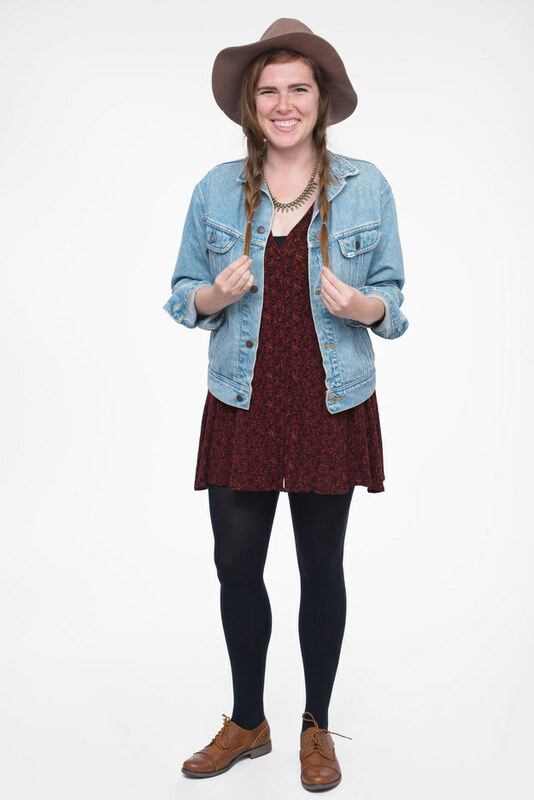 Yes, I felt like I was both an Urban Outfitters and American Girl Doll model, but I was definitely OK with this outfit. He did a really good job putting this look together from head to toe. Specifically my head, because he put me in two braids, which I haven’t worn since middle school, and requested that I borrow a “floppy-ish brown hat” from a friend. When I asked if I had to wear the hat the entire day, he said, “No. 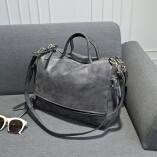 It’s an accessory, like a bag, Casey.” Duh, me, duh. Why my dad picked this outfit: I was thinking Grace Potter here. 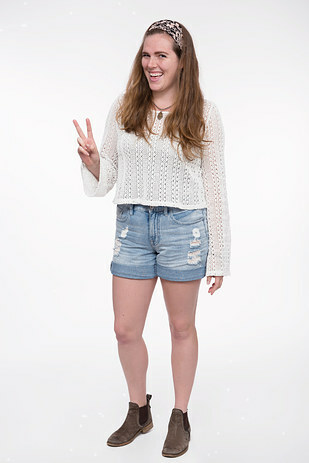 A loose-fitting white top and a headband to bring together the hippie look — perfect choice for a peaceful, laid-back day. When people see this look, they know exactly where you’re coming from. This outfit captures the free spirit in Casey. Casey’s Outfit #4 reaction: Guys, I liked this one. I look like the California beach babe that I never knew was inside me. She’s easygoing and all like, “Who’s down to kick around a Hacky Sack outside for a few?” Also, MAJOR props to my dad for adding a headband to his repertoire. It really pulls the whole look together. My only note with this one is that I was a little self-conscious wearing ripped shorts to work, but no one seemed to care at all. Why my Dad picked this outfit: I was going for casual here. The unique colored top with the worn jeans and matching shoes was a fun combination. I accessorized with some funky beaded and metal bracelets and added the scarf to bring out her eyes.When I think of a style that she can head toward in the future, I think of this look. Casey’s Outfit #4 reaction: I knew one thing going into this experiment and it was that my dad was going to find a way to add a scarf to my outfit. I don’t know why I had that gut feeling, but I did. I liked the lightness of the top, but all of the accessories made me feel like I was, as one co-worker said, going to “winter Coachella.” The bracelets clanked against my keyboard so many times that I almost gave myself a passive-aggressive “stop that” look to myself, and the ends of my scarf, which my dad insisted rest on my back to make the looping effect in the front, kept on almost falling in the toilet when I went to the bathroom. Why my Dad picked this outfit: Casey was heading to Las Vegas for the weekend, so I thought dark and fun. Casey didn’t have a lot of “wow” outfits hanging in the closet, but I really liked this velvet one. It’s a dress made for dancing. I’m thinking that she could embrace this look in the future and have fun with different colors and fabrics. Casey’s Outfit #5 reaction: Not too shabby, Dad. Not too shabby at all. I’m seriously impressed that he picked out my new Steve Madden block heels — from DSW, duh — and my dress that I wore on New Year’s Eve. I’m not someone who likes to dress up — I kept on showing him my three black jumpers to sway his pick — so I appreciated that he asked me to borrow a Las Vegas–suitable necklace from a co-worker. Because if it were up to me, I’d show up to ~the club~ in something black sans sparkle. 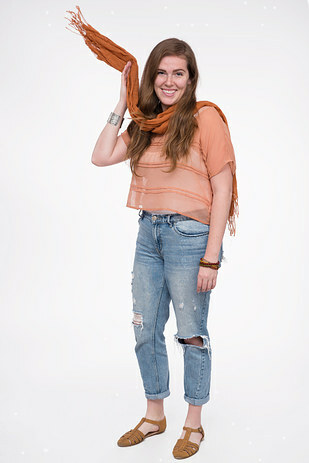 My dad’s pick: I think that I liked the easygoing vibe and color combination of the scarf outfit. Of all the looks, I thought that this one suited Casey the best. The colors on the top half of the outfit matched beautifully with her hair and eyes. I think that this is a good direction to go if Casey is ever looking for a new look. My pick: I think I love the Urban Outfitters/American Girl Doll/Indiana Jones look so much because everything about it surprised me. Even though I never wear braids or hats and I’ve only worn those shoes once, I really would wear this entire outfit again. He looked at my closet in an entirely new way and put something together that definitely fits my style. My dad’s pick: The hippie one. I wanted to put Casey in shorts for one of the looks but only liked these shorts. I might have gotten lazy with this choice. Although the laid-back attitude has been achieved, I think that I could have added some color to the look. My pick: I originally thought that the scarf look was going to be my least favorite because managing all of the accessories completely stressed me out. But in the end, I enjoyed how cohesive that look was and ended up turning to the sporty look as the one I could live without. Listen, I’ll wear that jersey when Reading is playing, but those awkwardly short and long sleeves are just not for me. 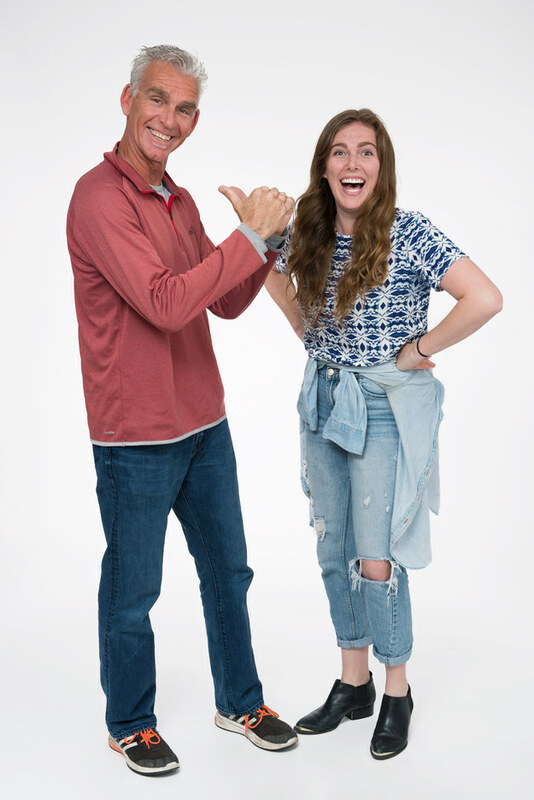 My dad: This was a blast to do, and if it takes me hanging out in my daughter’s closet to see her more, I’m doing it! Now that I have spent time as her official stylist, I realize that she could look even better if she took more chances with her wardrobe choices. Diversify! I never thought I would say this, but…let’s go clothes shopping! Next up: Casey dresses me for a week. Casey: This was a hilarious experience filled with mild embarrassment and lots of learning. Besides the fact that I think he *might* have dressed five different people with different personalities, he did a pretty good job overall. I quickly learned that he’s very detail-oriented and loves matching things, which resulted in him making me more put-together than I’m used to being. I won’t be a 25-year-old wearing ripped jeans forever, and so it’s kind of heartwarming to know that my dad already sees me as an adult even though I might not be there myself yet.